Welcome to Equestrian Boots & Brides – this is the Horse Tack and Equipment Page! This is your one stop shop to finding out about equestrian equipment – whether for riding or training – online. Are you about to buy your first horse? Or go to your first lesson where you have to bring your own tack? Or have you been taking lessons for a while using borrowed tack and are interesting in getting your own tack for the first time? Do you find that online resources on tack and equipment are often confusing and not to the point? Then this page is for you! This page will give you a breakdown of different types of horse tack including most importantly horse saddles, horse bridles and horse halters. We will also get into other more complicated equipment as the website develops and we’re always updating. If you can’t find what you’re looking for, feel free to contact us at admin@equestrianbootsandbridles.com or just leave a comment below! Here, you can learn about everything you need and want to know about horse tack and beyond. I also find that there is also so many different types and brands of tack to choose from online. I mean it was difficult enough when you just went to the store and had 50 english saddles to choose from. Now you go online and you have beyond thousands. You might narrow it down a little by price and the semi-descriptive titles but there’s still an overwhelming number of products to consider. Tack is expensive and you want the most value for your dollar but trying to find and sift through scattered reviews online is a hassle that you really just don’t have time for. Let me do the dirty work for you so you know with confidence exactly what you’re buying every time. Personally, I like to refer to a lot of tack online but I still urge you to go to the local tack shop and take a look. But this is mainly because used equipment is available there, which means it’s cheaper! You will find everything you need to know about equestrian tack and equipment here. Whether you are looking for a particular kind of saddle, or you want to know the differences between western and english bridles or you just want to know how to properly wrap your horses legs – this is the place for you. Horse Tack – Saddles, Bridles & More! English riding is one of the two main types of riding styles – the other being Western. Within it are a variety of disciplines, all of which are most notably characterized by the lack of a saddle horn on the horse’s saddle. Western riding is the second main types of riding style. Within it are also a variety of disciplines. In Western there is the presence of a saddle horn, the saddle is larger and more supportive to the rider and the stirrups are larger. Western bridles do not have a noseband or cavesson. 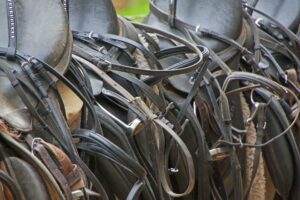 To learn more between the two types of styles as well as other types of horseback riding, check out the breakdown of the different types of riding attire used for each here. Within these categories there are different items of tack. A saddle is a supporting piece of equipment fastened to the horse by a girth. The saddle generally sits on/just behind the horse’s withers and this is where you sit when you’re riding. Horse saddles are meant to make riding easier and more comfortable for the rider. It’s very important that you size the saddle correctly for your horse otherwise you risk chafing them which can lead to sores and hair loss. Here’s one of our articles on how to properly measure for a saddle so that you make sure you and your horse are both happy! There are two main types of saddles (as you can see in the pictures above) and those are English saddles (no horn) and Western saddles (with a horn). Western saddles are also generally bigger, more decorated, heavier, and provide more support for the rider. They were created for long rides when cowboys would go herd the cattle, right? English saddles on the other hand were made to be minimalist, sleek and are often used for jumping or fine skill based events such as dressage. If you like going for trail rides with your horse, you may want to look into getting a saddle bag that you can carry snack and other supplies with! 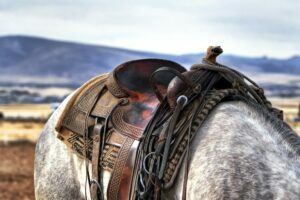 A girth or cinch, for Western saddles, attaches to the main part of the saddle and it’s what fastens the saddle to the horse by going round the front of the horse’s belly. A “second cinch” that goes around the widest part of the horse’s belly so it’s further back on the horse. These are also, along with the girth/cinch, something that I consider to be part of the saddle. The stirrups are the part that you slide your feet into when you’re riding. In English saddles, they generally have some sort of grip texture where the ball of your foot will be and they’re usually made of some sort of metal. In Western, they’re generally larger and made of leather. Bridles are used on the horse’s head in order to connect the horse’s mouth and nose with your hands as the rider. It’s used to enhance communication between the rider and the horse. Remember never pull on the horse’s mouth harshly or side to side – you should keep a light touch and rely mostly on your body and your legs to direct the horse! I think of the reins as part of the bridle. They are essentially the part that you will be holding when you’re riding the horse. Again, I think of bits as part of the horse’s bridle. This is the metal part that will be in the horse’s mouth. There are many many different types of bits. Saddle pads are used to keep the saddle from chaffing the horse’s back. As well-fitted as saddles can be, they will still chafe if they are directly on the horse’s back. There are plenty of different shapes and textures of saddle pads but as long as it covers the whole area between the saddle and the horse with some leeway incase the saddle moves a little bit while you’re riding. Here’s one of our articles on an introduction to horse saddle pads and what to look for when you’re buying them. Halters are used to lead horses around the barn, to turn them out, etc. They’re used with lead ropes, which are just ropes that can be clipped to the halter to lead the horse around with. Longe lines are long ropes used to train horses and lead them around in circles when teaching them commands, gaits, etc. A crupper is used to keep the saddle from sliding forwards on a horse, sometimes when the withers are very low or when extra stability of the saddle is needed such as for cart horses or in driving. Other Equipment – Health, Stables & Fun Stuff! Some horses may need leg wraps and some may not depending on what types of sports you’re doing with them and also based on their tendencies to rub their hooves against their legs. They may be meant for protection against hooves and also for compression due to inflammation or injury. Horseshoes are used on most horses to protect their hooves. They’re usually put on, changes and maintained by farriers. Check out this article on horseshoes to learn more. You’d be surprised for how many different types of horse toys you can find now! Even online, there’s a bunch of them! This ranges from buckets, to feeding hay nets, to salt blocks, etc. This is mostly what you’ll need to clean your tack and to store your tack properly. Generally, you’ll need somewhere good to hang your tack on because if you leave saddles just on the floor, they will get ruined pretty quickly so you want to avoid that. Also having a large sink is good to be able to rinse your bits and do your tack cleaning. This is the stuff you’ll need to be able to feed your horse’s including their different foods, any supplements that you’re giving them (although I talk about that a lot more on in the healthcare and supplements section). Make sure you have a good place to store all the food and keep whatever especially needs to be kept dry, actually dry. Also, having supplies to measure your food portions with is always a good idea as well! I go into more detail about this in the horse healthcare and supplements section again, but make sure you’ve got your shampoo, conditioner (at least I use both) and any other additional products that you want to be using on your horse. Of course, be very careful with what chemicals you use on your horse’s coat and skin. Make sure you have a hose and someplace nice and open to wash your horse on as well as somewhere they can dry out in the sun on a warm day. For more information on how to wash a horse, check out this article on horse bathing basics! Again this falls under a bit of the horse healthcare space as well but you need the proper equipment for it so I want to talk about it here. Cleaning and maintaining your tack is very important otherwise you’re going to spend a ton of money buying new tack every time yours dries up and cracks. Scroll down for more information on taking care of your leather! If you’re putting together you’re own arena you’ll need fencing, jumps, polls and letters. You need a rake and a wheelbarrow generally for this although you could get more sophisticated flooring or other equipment to make it easier. Saddle covers are covers that you use when your saddle is in storage to make the saddle last longer and protect the leather. Saddle bags are fixed on the back of your saddle and they’re used to store food, supplies and whatever else you want to take on long rides with you. I love them for long trail rides and back food and art supplies in them usually. Check out this article on my favourite saddle bag! 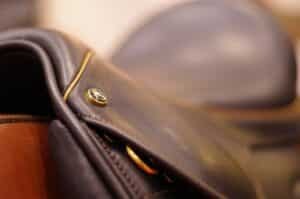 Synthetic tack is simple to take care of as you usually just need to rinse it with water for the most part but for all your leather tack, you want to make sure that you’re taking proper care of it. You should have some sort of cleaning regiment for it that includes quality saddle soap. The best part is that once you find a brand that you like with saddle soap, you can use it on all your leather including any real leather jackets or boots that you have. If you’re not familiar with how to use these products or you’re just not sure on how to clean your tack in general, here’s an article that we wrote that I think will be super helpful to you on how to clean your saddle. For all leather it’s the same technique! We will be there with you for your tack-filled journey! Whether you have questions like what types of tack go together? When you need certain types of tack? What other equipment you need? What brand you should buy? Full Catalogue of Tack & Equipment Articles: Read more about tack here! Thanks for the great article. You are correct in saying there are thousands of choices when it comes to tack and equipment and often I don’t know where to start if I’m shopping on line. I didn’t know that tack can be split into 3 categories. so I guess I’ve learn something new. Looking forward to more informative articles.